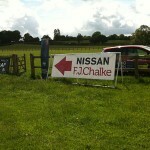 The Nissan LEAF will be attending the Gillingham and Shaftesbury Show with our team from FJ Chalke. You won’t miss us, our pitch will include the other franchises from FJ Chalke. We would like to invite you to come and take a look at the Nissan LEAF, and if you like what you see, why not book a free no-obligation test drive. I will be there to answer all of your Nissan LEAF questions and show you around the car. I look forward to seeing you there! 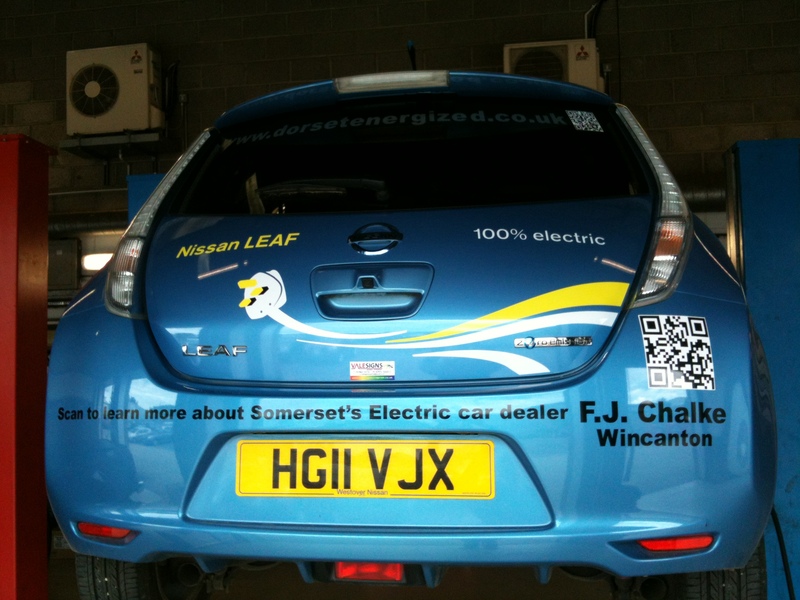 Vince’s Nissan LEAF Gets Dorset Energized with FJ Chalke! 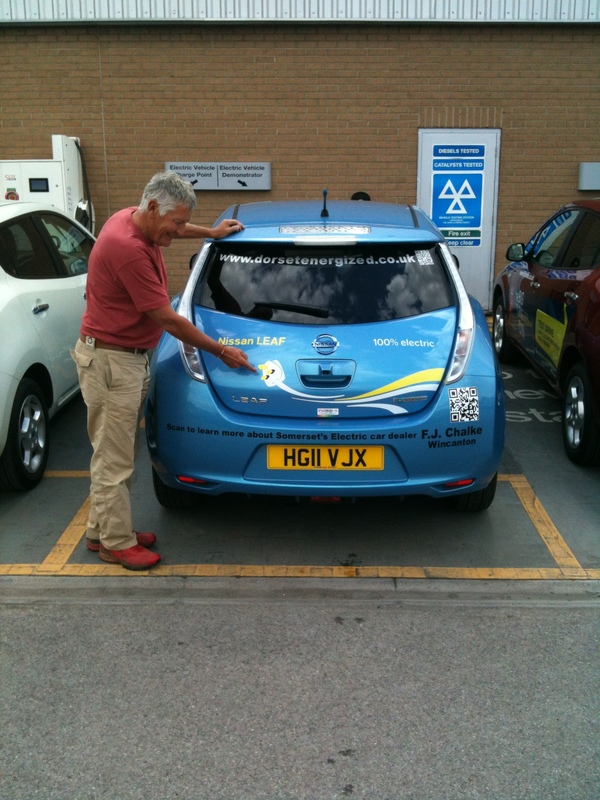 Dorset Energized’s very own Vince Adams came over to F J Chalke Wincanton today for his annual service… and to have the graphics done on his Nissan LEAF! Not only does it advertise the Dorset Energized website, but also gives people the opportunity to get directed via our smart phone QR reader, to our FJ Chalke – Nissan LEAF webpage for more information. This is a brilliant idea, as we work closely with Dorset Energized, and this really seals the relationship! 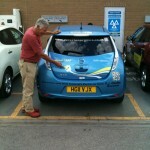 I think Vince is going to get a lot more interest in his Nissan LEAF then he does already (which I hear is a fair bit! ), and with the car parked up, people can access the information whilst they are curious about the car. Have you visited the The Big Turn On yet? Nissan LEAF aims to get one million people to Turn On to 100% electric driving on their fantastic The Big Turn On website at: www.nissan.co.uk/thebigturnon. 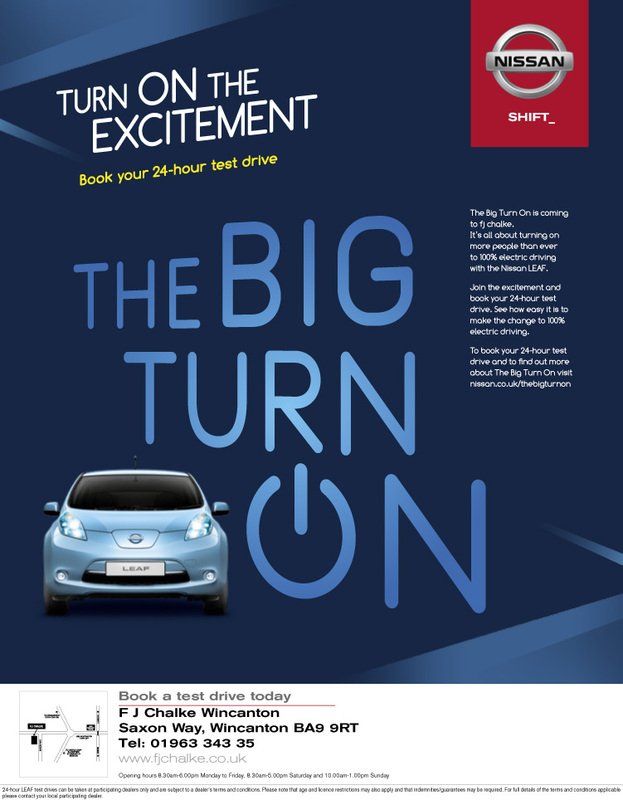 Once ‘Turned On’ you will be entered onto a leader board where you could WIN a Nissan LEAF or an iPad2 as their weekly prize. You can then gain additional points by taking part in various activities and encouraging other people to ‘Turn On’ too. Nissan will also donate rapid charging stations to the city with the most ‘Turn Ons’. Please help F J Chalke make Wincanton (in Somerset near Dorset) part of a low-carbon lifestyle for a more sustainable future, by turning on Wincanton! Check out the Winning Cities board here: http://the-big-turn-on.co.uk/leaderboard/cities/united-kingdom.html and click the ‘TURN ON’ button for Wincanton or your nearest city. Southampton and Bournemouth are currently in the top 30! 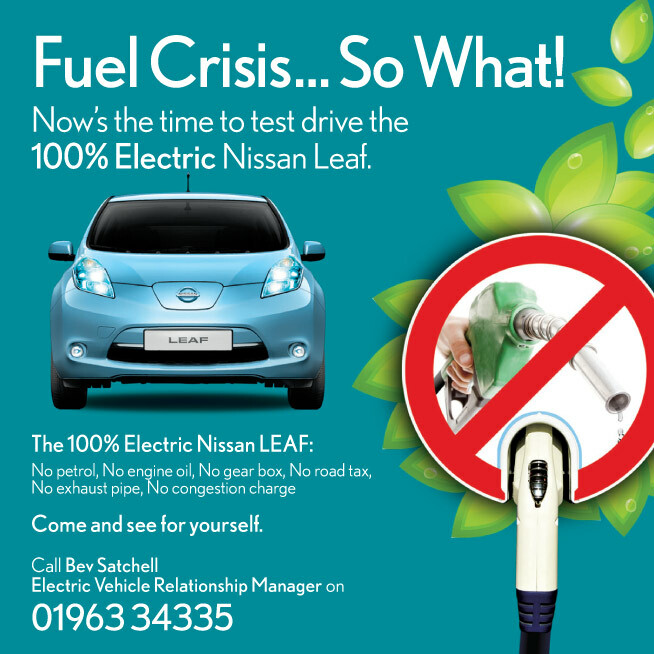 Remember you can book your FREE Nissan LEAF test drive with us at F J Chalke to see how easy it is to make the change to 100% electric driving. 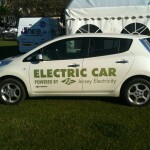 FJ Chalke have had a great couple of trips over the last couple of weeks showcasing the 100% electric Nissan LEAF. Shane and I had a very successful trip to Jersey and are planning another trip there at the end of the month because we have had so much interest in the Nissal LEAF and test drives booked. We have been working closely with Jersey Electricity, and we shared our pitch with them as they themselves have a Nissan LEAF that we supplied to them! They have had so much response since we left the island it has been unbelievable. We also had a great time at the Bath & West Show and met up with Glastonbury Festival founder Michael Eavis who signed another 6 month lease with us on his Nissan LEAF! Pre Show Tickets are available up to 15th June at cheaper prices than on the day! Children under 6 years old will be free. 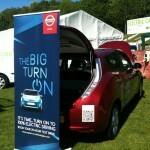 Its going to be a great day and we’d love to see you at our stand to answer all your questions about the Nissan LEAF. For more information visit www.fjchalke.co.uk/eco. 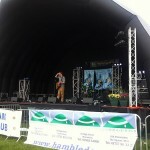 "The ‘Fathers day Shindig’ at the Gillingham and Shaftesbury showground was a great success. 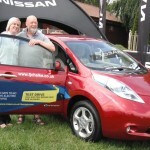 We provided demos in the Nissan LEAF so people got to experience first hand how fun it is to drive. It gave people that shock factor and that was what the demos were all about! People were left amazed. Even if these people were not serious Nissan LEAF buyers, their experience has left them with stories they can pass on to friends and family, and we hope this will stir interest in future test drivers. " 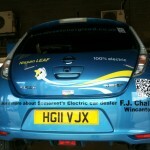 Look out for the 100% electric Nissan LEAF visiting a town near you! Join FJ Chalke and the new Nissan LEAF at the RUBiS Jersey International Motoring Festival, the largest annual motoring event in the Channel Islands, comprising of competitive sprint and hill climbs for classic and vintage cars and motorcycles. The full programme of events includes touring cars and motorcycles, ancillary trade stands and exhibits from all Jersey motoring clubs. Enjoy a friendly and relaxed atmosphere on the beautiful Island plus there’s opportunities for car and motorcycle enthusiasts to display their “pride and joy” whether this is a veteran, vintage or classic, touring or competition car or motorcycle. Have fun with the FJ Chalke Eco Team and the Nissan LEAF at the country’s biggest rural festival where there is something for everyone, from food lovers to families and farmers to fashionistas! There’s so much for you to see and do! Enjoy a Fathers Day festival of music and real ale with FJ Chalke and the Nissan LEAF at the Gillingham & Shaftesbury showground. 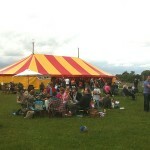 Live music, father’s day activities, refreshments, classic car display plus other vehicles. Its going to be a great day, don’t miss out! 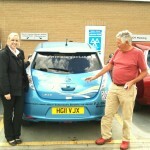 I’m Beverley, the Electric Vehicle Sales Manager for the Nissan LEAF at FJ Chalke, Wincanton. We are very proud to be in partnership with Dorset Energized. This revolutionary new car is the world’s first affordable 100% electric car with zero emissions and has impressed the media and potential customers alike, as well as picking up two of the motor industry’s biggest accolades by becoming both the European and World Car of the Year 2011 which, seeing as it is the first electric car to ever achieve this, shows just how good it really is. I haven’t been in car sales for long at all, and the Nissan LEAF is the first and only car I have ever specialised in. Customers sometimes are too afraid to walk into a dealership in case they are thrown into a massive sales pitch, when all the really want to do is take a look at a car, and possibly test drive it. 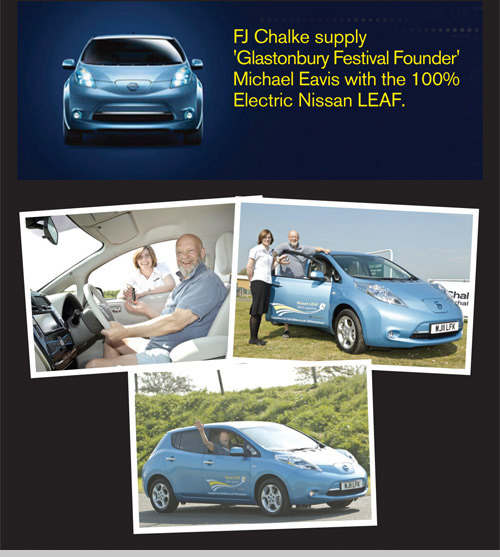 So to celebrate Climate Week, FJ Chalke will hold a test drive open week for the Nissan LEAF 12th to 17th March. 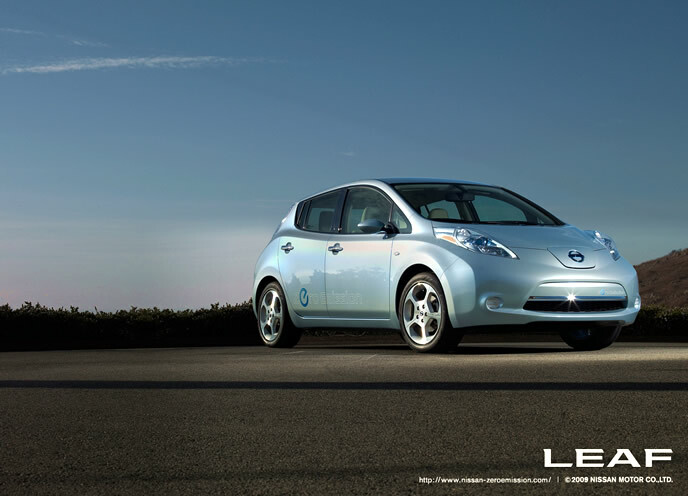 No strings attached, just come in, take a look at the LEAF and getting a feel for the car by taking it for a test drive and experience the real deal for yourself. All we would ask for is feedback. Founder and organiser of the world famous Glastonbury Festival, Michael Eavis, is one of the countries biggest pioneers for all things environmentally friendly and advances in eco-technology. He has had 1200 solar panels fitted to the roof of one of his farm buildings and, along with his staff, is always looking at other ways of reducing CO2 emissions and running costs of the farm, right up to the point where plans are being drawn up to have a third reservoir made to utilise hydro-electricity. 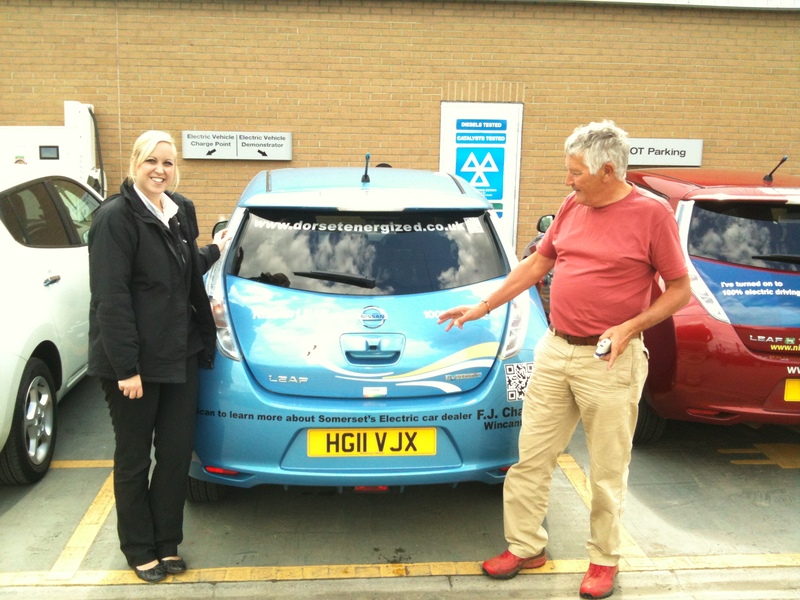 So when FJ Chalke Wincanton introduced the Nissan LEAF to him, he jumped at the chance to give it a go. Currently driving a car on loan from us he has already expressed the desire to buy the vehicle. With the car charging from electricity generated by his solar panels Mr Eavis is enjoying totally free motoring. He is very impressed with how the car performs and what it is like to drive. Enjoying it so much his wife started a daily blog detailing how the car is used and how it is versatile and practical enough to handle a multitude of day to day activities. Whisper quiet to drive it does not disturb the peaceful surroundings of their farm and local village. Like Nissan and the team at FJ Chalke he firmly believes that electric cars are the future, Nissan has proven the technology is here and that it works, and works well. He has even thought of installing a charge point near the entrance to Worthy Farm so local people who invest in an electric car, so therefore a greener future, can come and charge up. "Glastonbury Festival founder Michael Eavis has just signed another 6 month lease with Dorset Energized partners FJ Chalke on his Nissan LEAF! " DEStination Travel are a local taxi company based in Wincanton. They specialise in airport and seaport travel but they also have contracts for local schools. With a fleet consisting of buses, minibuses and mostly cars, it was important to them to find a way of reducing running costs and their carbon footprint. A company clearly conscious of the environment and their affect on it lead them to have solar panels fitted to the roof of their building. The next step was to look at the running of the fleet. 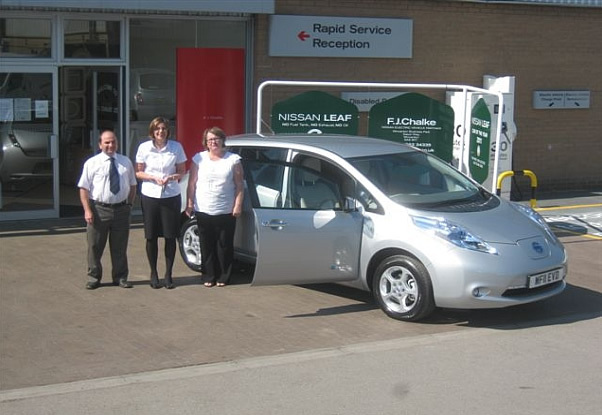 They bought a Nissan LEAF from FJ Chalke Wincanton because it was perfect for the local school journeys and town to town runs. Not using one of the petrol cars for this work has meant fuel is being saved. They are really happy with the LEAF and still very impressed with how much cheaper it is to run and maintain compared to their other cars. No engine, no oil, no gearbox and no exhaust mean servicing is drastically reduced in cost. It comes with the added advantage for business users; LEAF is 100% tax deductable in the first year. LEAF is able to carry 5 adults comfortably and has a generous boot space, making it more than suitable for use as a taxi. Its smooth, quiet ride makes it a relaxing journey for passengers. It is also among the safest cars on the road, being awarded 5 STARS in the Euro NCAP Crash Safety rating.